Major General United States Army, Ret. A Valiant Peace Warrior Has Passed. Albert "Bert" Newton Stubblebine III (February 6, 1930 – February 6, 2017) was a United States Army major general whose active duty career spanned 32 years. Beginning as an armor officer, he later transferred to intelligence. He is credited with redesigning the U.S. Army intelligence architecture during his time as commanding general of the U.S. Army Intelligence and Security Command (INSCOM) from 1981 to 1984, after which he retired from active service. Stubblebine's statements questioning the plausibility of the damage done to The Pentagon by the hijacked aircraft during the September 11 attacks suggest that there was a conspiracy involving some elements of the U.S. government. A SHOCKING claim from a top Army General that it was a missile and NOT a plane that hit the Pentagon during the September 11 attacks has re-emerged online. Retired Major General Albert N. Stubblebine became the biggest name to disagree with the official version of events a few years ago. 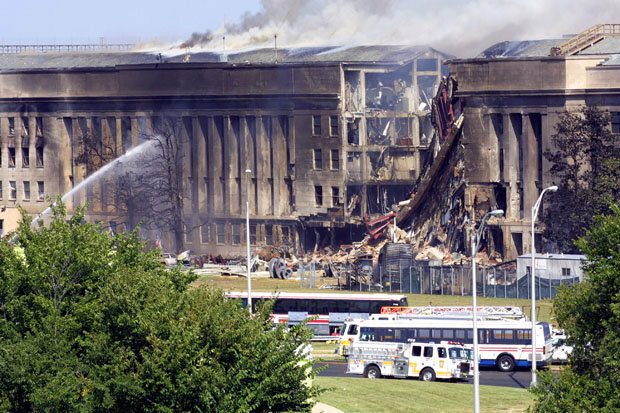 On September 11 2001, two planes ploughed into New York City’s Twin Towers and another jumbo jet smashed into the Pentagon – the headquarters of the US Department of Defense. Well Major General Stubblebine didn't believe half of it. The top brass, who was US Army’s Intelligence and Security Command from 1981 to 1984, went on the record to say that he believed his country’s government was lying. In an interview, the ex-top military brass, 86, said he carefully examined the partly-destroyed Pentagon in the aftermath of the attack and changed his mind about what happened. Stubblebine initially believed the official story regarding 9/11. Then, he saw the hole in the Pentagon. He can prove that the Pentagon was not hit by a Boeing 757. DOT. All of the sensors around the Pentagon were turned off except one. That one sensor captured an image of the object that hit the Pentagon. It looked like a missile. But, after he went public, the imagery was changed to look like a plane. DOT. The collapse of the twin towers was caused by controlled demolition – not the fuel from the airplane. DOT. Larry Silverstein, the lease holder of the WTC complex, admitted that that building 7, which was not hit by a plane and had only a small fire, was intentionally “pulled” – which is phraseology used for controlled demolition. DOT. All of the air defense systems around Washington DC were turned off that day. DOT. Also on 9/11, there was an exercise designed to mimic an attack on the towers by airplanes. DOT. When you connect the DOTs, the picture says that what we were told by the media was not the real story. 6:00 Stubblebine said there must have been intelligence information to know that an attack was coming and we didn’t see the signals. Somebody missed it. 15:50 There was an exercise that was designed for the air defense systems that was an attack on the towers by airplanes. Isn’t that strange that we had an exercise that mimicked what really happened? Strange that we had planned an exercise that was exactly what happened. And, at the same time, the air defense systems were turned off. Don’t you find that strange? I find that really strange? DOT. Just a piece of information. 18:30 The real story was, I have a question I guess. The real story to me is: who was the real enemy? Who participated in this? Who planned this attack? Why was it planned? Were the real terrorists the people in Arab clothing? Or, were the real people that planned this the people sitting in the authority in the White House? Connecting the dots, a very clear picture emerges: (a) American Airlines Flight 77 (a Boeing 757) disappeared from radar and never re-appeared; (b) instead, a smaller military craft appeared on radar 36 minutes later that was capable of performing a difficult maneuver and could approach the Pentagon without being shot down; (c) a low-flying military craft approached the Pentagon but merely flew past the Pentagon immediately after the Pentagon was struck by a missile. There is no evidence that either the airplane engines or the wings impacted the building. Instead, we are supposed to believe that the 38 meter (125 feet) wide Boeing 757 fit into a hole that is only 5 meters (16 feet) wide. We are supposed to believe that the wings folded up like those of a dragon fly and squeeze into the 5 meter wide hole. One theory is that the Boeing 757 was vaporized due to the speed and the force of the crash. The engines are made of a titanium steel alloy that would not vaporize unless they hit a temperature of 3,286 degrees Centigrade. That did not happen. Plus, the engines would have caused significant damage upon impact. Yet, there is no indication that the engines impacted the Pentagon. After a period of time, various photos of airplane debris began to appear in newspapers and on the web did not appear in any photos shown in the days following the event. The Pentagon had numerous cameras that had complete and separate recordings of the incident. The FBI was immediately on the scene and confiscated many video tapes from the Pentagon and nearby buildings. Yet only four videos were released after 2006 when FOIA requests compelled them to release them. Only two showed any useful information. But most experts believe the white image in the videos is too small to be a 757. The story of how the plane arrived at the Pentagon is absurd – by making a 270 degree turn at a speed of 800 kilometers per hour. According to the official account, the Pentagon was struck by AA Flight 77, under the control of al-Qaeda hijacker Hani Hanjour. Hanjour was known as “a terrible pilot,” who could not even fly a small airplane. No unknown aircraft are allowed within 50 miles of the Pentagon. The Pentagon has its own anti-aircraft missiles that should have fired to protect the building. Only a military aircraft with a special IFF transponder (identifying it as a friend) would be allowed to approach the Pentagon. The official report of the final half mile of Flight 77 before it allegedly hit the Pentagon is aerodynamically impossible. “I challenge any pilot, any pilot anywhere: give him a Boeing 757 and tell him to do 400 knots 20 feet above the ground for half a mile. CAN’T Do. It’s aerodynamically impossible.” – Nila Sagadevan, pilot and aeronautical engineer. The alleged hijackers had difficulty flying small aircraft, which means that there is a zero possibility that they could pull off an impossible maneuver on the first try. In the video below, pay close attention to the aerial footage that begins at the 4:25 mark and especially the closeup shot at 4:50. Where is the plane debris? The footage shows exactly what McIntyre described: there was no plane debris. Note that Rumsfeld indicated that both a plane and a missile were used on the Pentagon, which matches up perfectly with evidence presented in the video, Undeniable Proof a Plane did NOT Hit the Pentagon on 9/11. In an interview in September 2006 with CNN’s Miles O’Brien, former 9/11 Commissioner member, Timothy Roemer, says that a missile caused the damage to the Pentagon and then quickly corrects himself to line up with the official story. Recall that Stubblebine said that he saw the original video tape showing object that looked like a missile hitting the Pentagon, and then the tape was altered. Below is an analysis of the video footage that allegedly shows Flight 77 exploding as it impacts the Pentagon. The frame-by-frame analysis shows the fuselage is still in view when the explosion occurs. In addition, the brief footage of the nose of plane certainly does not look anything like a Boeing 757. April Gallop and her child survived the ‘impact’ at the Pentagon. She was a Pentagon employee who was inside the building sitting at a computer when the explosion occurred. After escaping through a hole in the Pentagon wall she waited on the grass near the road before being taken to the Hospital. She did not see any plane debris or experience any jet fuel or any other evidence of a plane crash. Another Pentagon Witness: I was convinced it was a missile. Next, the official version of the Flight 77 flight path (as specified by the 9/11 commission and the alleged “black box” data released by the NTSB in 2006) is established as being south of the Navy Annex and south of the former CITGO gas station. This is key information that has to be true in order to explain the angle of entry that caused the physical damage to the Pentagon. In part 2, we are shown images and animation of the path that the plane must have taken in order to knock over five light poles and damage the Pentagon in the manner that it did, which is the official story. The location of the downed light poles is important because it establishes the required location and trajectory of the plane down to the foot. Part 2 also contains interviews with the first two witnesses (Edward Paik and Terry Morin), who were positioned on the south side of the Navy Annex (vantage point #1) as the plane flew over. Both Edward and Terry saw the plane fly directly over the Navy annex to the north of the “official” path. Of particular significance is the interview with Morin, an aviator and a program manager for SPARTA Inc at the Navy Annex. Initially, Morin was between the wings of the Navy annex, so he could only see the plane as it “flew over the top of me.” Morin than ran over to get a better view and watched the plane for 13-18 seconds. Morin, as an aviator, disputed the official report that the plane was flying 460 knots. Instead, Morin says that the plane was only flying at a speed of around 350 knots. Part 3 contains interviews with three witnesses who were at the CITGO gas station (vantage point #2) on 9/11 when a low-flying plane flew by. Robert Turcios, CITGO station employee, saw the plane on the north side of the station and initially thought the plane was going to crash onto the street between the station and the Pentagon, but saw the plane “lift and go up a little bit.” He did not see the plane hit the Pentagon. In addition, Pentagon Police officers Chadwick Brooks and William Lagasse each confirm that the low-flying plane flew by on the north side of the CITGO station. Morin and Lagasse independently draw a nearly identical, flight path lines showing an approach to the north of the CITGO station. Next, an interview with a witness who was located on the north side of the Navy Annex (vantage point # 3) on 9/11 is shown. William Middleton Sr., an Arlington Cemetery employee, said that he plane was coming straight down Southgate road on the north side of the Navy annex. Middleton also said that he could see the plane dropping in altitude and that it came so close to where he was standing that he could feel the heat from the plane. In addition, Middleton said that the plane was travelling at a “slow” rate of speed, corroborating what Terry Morin had said. After the interview with Middleton, interviews with Arlington Cemetery employees Darrell Stafford and Darius Prather, who were positioned at the Arlington Cemetery maintenance buildings (vantage point # 4) on 9/11 are shown. Both said that a plane was coming directly at them and that after barely clearing the Navy Annex building, the plane continued descending and at the same time was banking to the right. The banking of the plane to the right is irreconcilable with NTSB data, physical damage to the Pentagon, and the Pentagon security video. This video segment starts with an interview of another Arlington Cemetery employee, Donald Carter, who was also positioned at the Arlington Cemetery maintenance buildings (vantage point # 4) on 9/11. Carter’s testimony is similar to that of his co-workers, Stafford and Prather. Boger stated that he saw a plane come over the Navy Annex and bank right toward the Pentagon. Based on the amount of time he watched the plane after he first saw it, the plane was travelling significantly slower than 460 knots. From five vantage points, 13 eyewitnesses independently and unanimously confirm a north side approach. A drawing is shown depicting the paths drawn by the witnesses. The eyewitness testimony contradicts the official reports that are required to make the official story plausible. All of the eyewitnesses have worked in the area for many years and are therefore very familiar with the topology and landmarks. Since the release of their interviews in the public domain, all have been made aware of the implications yet stand by their stories as reported. None have claimed that their accounts have been misrepresented. Most of the witnesses could not see the alleged impact point due to the complex topography and landscape, and admit to running, dropping, or flinching for cover. This explains why they did not see the plane fly away and assumed that it had hit the Pentagon because of the explosion. The independent and unanimous placement of the plane on the north side and banking to the right amounts to proof beyond a reasonable doubt that the plane did fly away without hitting the building because the damage to the Pentagon required a south side approach. Pentagon police officer Roosevelt Roberts Jr. saw the plane fly away immediately after the explosion. He was at the Pentagon south parking lot loading dock, only a few steps inside the building during the explosion. After hearing an explosion, he ran outside, looked up, and saw a plane flying around the south parking lot. Roosevelt describes seeing a commercial jet that was banking and flying away at less than 100 feet above the ground within 10 seconds after the explosion. Roosevelt could have only seen the same banking plane that all of the other witness reported seeing on the north side flight path. Multiple witnesses have testified to seeing a banking, low-flying plane approach the Pentagon from the north side of the former CITGO gas station. This means that the damaged light poles, of which one allegedly went through the windshield of a taxicab, had to have been staged. Although there are photos of a bent pole laying on the ground and a broken windshield, not a single photograph exists showing the 40 foot, 247 pound pole inside the cab. Taxi cab driver, Lloyde England, initially claimed that a silent stranger helped him remove the light pole from his car. A 247 pound light pole knocked over by a 90 ton Boeing 757 traveling 530 miles per hour certainly would have caused massive damage had it hit Lloyde’s taxi. However, the only visible damage to the taxi is the broken front windshield. Otherwise, the taxi was unscratched, which makes absolutely no sense. However, don’t forget that testimony from multiple witnesses has proven that none of the downed light poles could have been knocked over by the incoming plane. Therefore, the lack of damage to the taxi does make sense. After Lloyde was confronted with the information provided by the witnesses indicating a north side approach (and that therefore the downed light poles must have been staged), he had a very strange reaction. Lloyde then changed his story and refused to admit that his taxi was on the bridge next to the downed light pole, where it appears that photos of both Lloyde and the taxi were taken. Lloyde goes on to explain that history has nothing to do with the truth and that he was used by people who have money. He then essentially admits that the downed light pole was staged and pre-planned. But, he was cautious not to outright confess. He distanced himself from the planners while admitting that the staging was planned. The lack of any evidence that a plane hit the Pentagon, eyewitness testimony of a banking, north side approach, eyewitnesses who saw a low-flying “jet” fly past the Pentagon that “kept on going,” plus Lloyde’s confession that the downed light pole was preplanned and staged all provide ample evidence proving that a Boeing 757 did not hit the Pentagon, but instead a smaller “jet” merely flew past the Pentagon immediately after it was hit by a missile in order to appear as though a plane did the damage.